HCM City (VNA) – Ho Chi Minh City should be turned into a smart city capable of deeply joining regional and global value chains and competing with its counterparts in Asia. 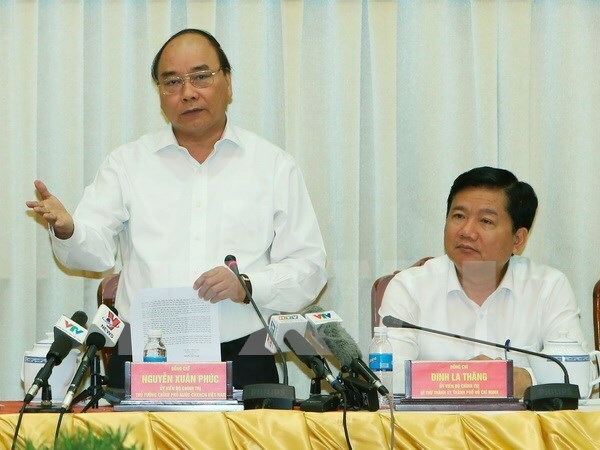 At a working session with the municipal key leaders in HCM City on June 27, Prime Minister Nguyen Xuan Phuc underlined the need for the southern metropolis to carry forward its role as a national centre of high-quality human resources and a destination attractive to investors and entrepreneurs. A smart economy the city is gearing must be driven by the high-technology sector, he said, asking the locality to pay more heed to the application of high technologies and sciences in the management work and business and production activities. He called on the local Party Committee and authorities to be resolved to fulfill socio-economic targets set for the second half of this year, especially those regarding budget collection, economic growth and inflation curbing. At the same time, the city should step up efforts in streamlining administrative procedures, improving investment climate and ensuring traffic safety and social order, the Prime Minister said. The gross regional domestic product (GRDP) expanded by 7.47 percent in the first six months of 2016, while the consumer price index (CPI) increased by 1.79 percent. The city collected nearly 144 trillion VND (6.48 billion USD) to the State budget in the period. The total social investment capital reached 125 trillion VND (5.62 billion USD), a year-on-year increase of 9.1 percent. It is striving to be one of the country’s top localities in public administration performance, competitiveness, and administrative reform index. The city has simplified administrative procedures in the fields of investment, land and construction, saving over 110 billion VND (4.95 million USD) each year.